Good things come in small packages – the same is true of chia seeds which are extremely good and power packed with nutrients and minerals. Chia seeds have become popular in recent years due to the many health benefits that can be gained by eating them on a regular basis. These seeds can easily be incorporated into your diet by doing things like mixing them into your yogurt at breakfast and adding them to a post-workout smoothie. Chia seeds are a rich source of calcium. 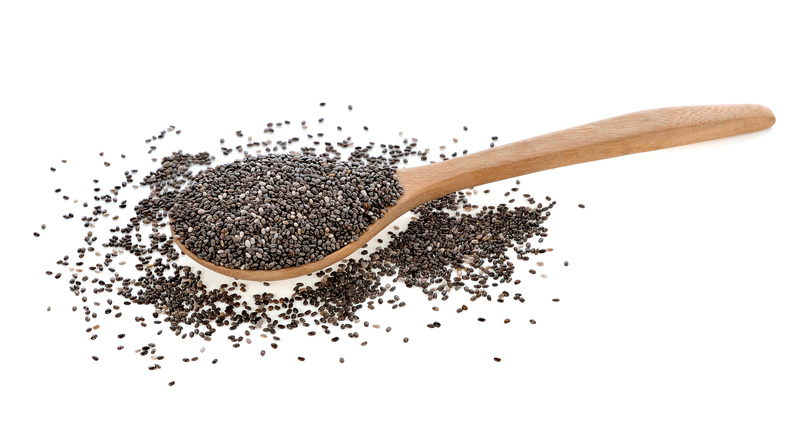 Two tablespoons of whole chia seeds provide more than 130 milligrams of calcium. Calcium plays a role in energy metabolism, and it may help regulate body composition and reduce body fat percentage. Using chia seeds each day you can help boost your metabolism and burn belly fat as well! Studies show that the addition of chia seeds to your diet also reduces visceral adipose tissue, a “belly fat” tissue that effects the metabolism of the body and is a component of obesity! Chia seeds are good for your overall digestive and metabolic health. Some of the most recent studies have linked chia seed consumption with healthy blood sugar levels, HDL (good cholesterol), cholesterol as well as reduced levels of triglycerides (blood fat) and LDL (bad cholesterol). These can safely be consumed by diabetics and can also aid in maintaining a healthy heart and bones. Soak the seeds in almond milk or water (1/4 cup seeds to 1 cup liquid) until they take on a chewy texture reminiscent of tapioca pudding, about 20 minutes. Soaked chia seeds can be refrigerated for up to 5 days, so you can make a big batch at the start of the week. Throw them in your smoothies, yogurt or even in oatmeal!